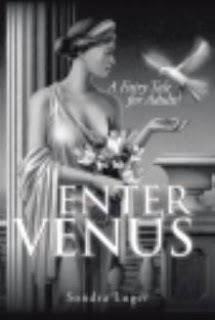 In ENTER VENUS the Goddess of Love comes to earth to save a marriage that’s falling apart. In the course of her magical ministrations, the art masterpieces at the magnificent Frick mansion spring to life and into action and a torrential downpour sweeps characters from a New York City street to Venice, Italy. Sondra Luger taught English in a New York City high school. Her first romantic novel, RICH, NEVER MARRIED, RICH was inspired by Jane Austen’s PRIDE & PREJUDICE, and her second, BACK FROM BORA BORA, was inspired by the business world of the young and the resilience and energy of the so-called aged. Her mysteries, DROP ME OFF IN HARLEM and MURDER ON BROADWAY, both of which feature the same female fashion model detective, are a tribute to the Roaring Twenties and to the author’s mother, who was a high fashion model. Sondra comes from an arts-oriented family with musical talent, and she has recorded a music CD with her sister, singer and songwriter Carolyn Luger. The songs were written by music icons of the twentieth century. The album is TAKING A CHANCE ON LOVE.